from 10/8/2015...I was in the market for a used late model low mileage GMC or Chevrolet 1500 Crew cab truck under $20k. I had been looking around Jacksonville and the surrounding areas for approximately 2 weeks with no luck I found their add on Cars,com for a 2010 GMC for $19,995. I made a call and verified the truck was still available and ended up at the lot just before 6:00pm On Saturday and was greeted by a gentleman who in a relaxing yet attentive manner showed us the truck and got us on our way for the test drive right away. to my surprise they let my wife and I take the truck without the usual salesman ride along. this is a nice method as you can really scrutinize the vehicle without distracting sales pitching going on. He had a concert to go to and assured us we would be handed off seamlessly to another team member as soon as we returned. from our return Jeff the Finance Director took over and we discussed my situation. I already had a $20,000 check from my credit union and I was looking for a deal that would get me OUT THE DOOR for less than $2000.00 out of pocket. I had looked at many trucks over 2 weeks that were similarly priced and some priced lower but the Big Dealer "PLUS PLUS PLUS" would put me coming out of pocket about $5000.00. The dealer fee is more than reasonable and with tax tag title I wrote a check for less than my $2000 goal and drove off with that truck by 8pm. Jeff and the crew are to honest and accommodating to be called used car salesmen... I think a better term would be Vehicle Ownership Transition Specialists. I defiantly recommend you give them a shot at helping you transition into ownership of a vehicle that fits your needs and not a Big Dealers profit margin. Oct. 31, 2015... As a first time buyer I was extremely nervous about the whole car buying process. I was in a tight squeeze and was afraid I would not be able to afford anything. While walking the lot, numerous salesmen came to my aid in searching for the right vehicle. I found the perfect one that met the criteria for the First Time Buyers Program. Jeff was absolutely amazing. He was able to get me in the vehicle that I wanted and at a price that I could afford, without all of the haggling and drama. Such an amazing team at Southern Trust Auto Group. I would definitely recommend this dealership to anyone looking for a great used car at an even better price. 11/04/2015... Let me just say, I have purchased many car's from dealer's , but Southern Trust Auto Group these Guy's where Great, I made 1 call to them next day out the Door Driving my New Truck. Best Experience I ever Had. from 10/21/2015..The entire team was awesome, friendly and caring to your needs. Jeff Anderson was awesome and he really goes out of his way to satisfy your needs. I would 100% recommend friends, family and coworkers to this dealership and its awesome team. I drive down w colonial quite often. Always see great cars, trucks and SUVS on this car lot, with a 2 story, blue building - Must be 100- 150 good looking, clean vehicles... But, I am always in a rush, so i had never stopped. Finally, one day i couldn't help myself- I had to loop back- Too much to see on a fast drive by. I'm GLAD I did. I walked around for a bit, fell in love with 3 or 4 trucks and was greeted by a man with a smile- a no pressure guy, named Chris- he was a great help in narrowing down the best and most practical ride for me. I left that first day with a lot of knowledge and a good feeling BUT needed to do my homework, as they offer a NO- HAGGLE pricing structure with their inventory and a truck was not my typical purchase. However, I went right back the next day. The details Chris shared about the ones I liked, the options, the NEW TIRES and - prices that they offered was dead on, FAIR! HOW REFRESHING! Now, was the tricky part- I had to talk about my personal credit... I had a few dings (unlike the perfect Chevy that I "NEEDED" at this point:) This brought me to Jeff. Jeff is the finance mgr- he is very professional and a great listener- He was honest and upfront, completely transparent and he worked HARD to get the best rates and terms that would keep me in line with my financial guidelines in order to fulfill my commitment on my cool new ride. I am SO IMPRESSED with the whole experience- I've got my Mom going this weekend to talk to Chris about the best small and practical SUV he recommends- (Me, I had to have a FULLY LOADED, LOW MILEAGE CHEVY, SUPER BAD SILVERADO!!! :) This group is truly the most honest and transparent team of business professionals I have worked with in a long time. I will ALWAYS recommend them- CALL them- GO there- (407) 654- 6767. Be ready to have your "DREAMS TURN INTO YOUR REALITY" * I DID! Great place to do business, loved the laid back casual feel of Southern Trust! Will definitely visit again. Ask for Johnathan, he's superb at Customer service. 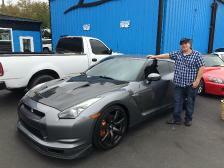 Owner Chris was a pleasure to deal with and Jeff in Finance was great as well. 5 Stars! by Kim from Daytona Beach | February 22, 2014 Jeff was simply amazing! We had researched several cars online but found the price point and the mileage of the 2008 Lincoln Navigator at Southern Trust to be the best. Cargurus confirmed it was a good deal, NADA confirmed it was a good deal, even our insurance company confirmed. 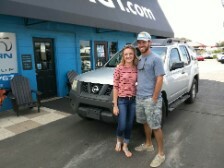 We drove to the dealership and Jeff got us financed and out the door in a couple hours. Highly recommended!!!! 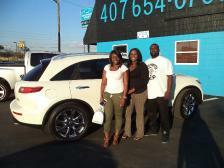 by Latosha from Orlando ,FL | March 6, 2014 Let's just say I love my car!!! 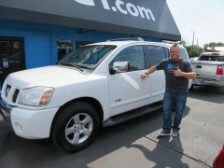 A few weeks ago I purchased a white infinity mid size truck from Southern Trust Auto Group. The whole experience with AUTO GROUP was great! They help me get into the car that I wanted and also for a good price. 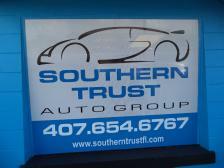 If you are looking for a good quality car that will last a long time I would totally recommend Southern Trust Auto Group. From their amazing welcoming and friendly staff to the cars and trucks , you will love to purchase a vehicle from them. So be sure to drop by and tell them that my review sent you lol . keep up the great customer services and prices !!! All I can say is WOW Southern Trust Auto is amazing! Jeff was so helpful and informative, more than anyone I've ever done business with. If you need a car and do not want to deal with the "car salesman" type of people go to Southern Trust you won't be disappointed!!!! 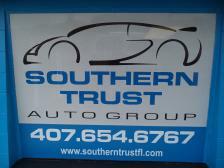 by JW from Orlando, FL | March 4, 2014 Southern Trust is truly a "no haggle" dealership. Jeff and Chris did an outstanding job of meeting my needs and most importantly I did not fell pressured. Outstanding customer service! From: Lance, Renny, and Tiffany (very satisfied customers from Oakland, FL).... As you know we were looking for a couple of weeks for a Mercedes and visited a few Mercedes dealers in Winter Park and Orlando. However, we did not expect you to be so willing to work with us in getting us the car we wanted, the best priced buy and the financing arrangements needed. You definitely went the extra mile and provided excellent service with plenty of patience. You guys were just so friendly and helpful in every way. There is no doubt the "trust" in us was shown by you! 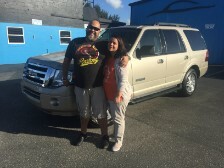 In my many years of experience in buying cars in Central Florida this experience has been the best. We highly recommend your dealership as the best place to buy in Central Florida. And, we wish you the best of success. I had an excellent buying experience at Southern Trust, especially considering that I'm a first time buyer. I got the whole package from Southern Trust--excellent and prompt communication, straightforward honesty, and not to mention a great deal. Jeff and Chris know their stuff and aren't going to give you the work around. Jeff answered my e-mails what seemed like around the clock, even on Sunday night. I showed up to the dealership and we were able to lock down a good deal almost right away. Being a first time buyer, I was nervous about the entire concept of making a commitment to a financial institution, but the guys laid it out for me in a very straightforward manner. I left feeling much better about the auto sales industry because guys like this exist. I'll be referring my buddies and anyone else for that matter to these guys for the foreseeable future. I'm thrilled with the car I got for the deal they gave me. Their no-haggling, no-nonsense approach really gives you an idea for what the vehicles are worth rather than what some big-box dealers just throw on a sticker. Think independent! I ended up trading in my 2005 SRT-4 in for a beautiful 2010 Lancer GTS Sportback. They also have a great warranty system and partners to protect you bumper to bumper after purchase. In looking around the lot, it seemed they bring in nothing but quality to the dealership as well. I did my best not to sound like I work at the place, but I was really that pleasantly surprised with the experience. I expected to walk in there with gloves up ready to get sold on and anything and everything I didn't need or want, but it was everything but that. I either liked the car, or I didn't. And I did! We just purchased a Nissan Altima from Jeff Anderson, after purchasing a Toyota Prius, and a Volkswagen Beetle. Jeff is a great listener, and a real pro. He found the vehicles we were seeking and also arranged financing. He is a clear communicator, responsive, and great to work with. We look forward to our next vehicle purchase from Jeff. We have a large family, and may never purchase a new vehicle again because Jeff is so good at finding the used cars we want. 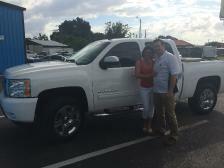 by Braves73 from Ocoee, Fl | September 11, 2013 Easiest car buying experience I have ever had. I found the vehicle online, so I knew what I wanted before stepping foot on the lot. When I arrived the vehicle was in the advertised (excellent) condition and at the advertised price. I told the salesman Jeff the terms I was looking for and he said it wouldn't be a problem. After taking a test drive, we negotiated the final terms and I was out the door with my new ride in just over an hour. Jeff was friendly, knowledgable and not pushy or a high pressure salesman. I have nothing but good things to say about him and the dealership. I have already talked to him about my next vehicle purchase and plan to make SouthernTrust Auto Group first on my list for my next purchase. I highly recommend them for anyone looking to buy a quality used vehicle. Don't be fooled by the "no frills" exterior of this auto dealer. They are first rate, have a great selection of automobiles to choose from and Jeff was outstanding. I received the best price when purchasing my BMW. Love my car. No problems. Rogue from orlando, fl | October 4, 2013. My husband and I purchased our car from Jeff with absolutely no problems. The shortest possible amount of time was spent in the office. We had no trouble and he gave us the best price we could've asked for. Highly recommend! Had to let my old truck go and change over to something that doesn't cost too much in fuel. Long commute from home to work. Prius is very accommodating. Overall, good experience at the dealership through the whole process. Jayce has been pretty helpful. Happy with my new purchase. Chris and Jeff were very professional. I searched several dealerships for the vehicle and it was available. The purchase process was quick and convenient. I was in and out within two hours. This is superior customer service. Customer service was great and they made the process really easy. Great Experience!! They treated me great and straight to the point. Sales rep was awesome, got me a great deal and I drove out with the car I wanted. Thanks guys and I'll make sure to send anybody looking for a car your way. Thanks again!! After visiting several dealerships and scanning the internet I found exactly what I was looking for at this location. 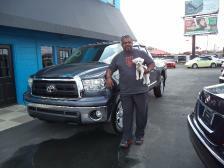 The guys working at this dealership are friendly and knowledgeable,. We looked at several cars before I found the one I wanted. Closed the deal the same day and with zero issues. I'm a happy customer! These guys ROCK! I have purchased many used and new cars and trucks over the years. I have never had a better buying experience anywhere. Very honest and attentive. No pressure! TOP NOTCH inventory. I am a Salesman and drive a 4 county area in Central Florida. I shopped for over three months for a trade. This dealership captured my attention at first because of the selection of inventory however after making contact I was won over by their willingness to work with me as I had an unusual trade in. A Pro Street Car project that was not completed, a trailer to haul it on and a SUV that had a lot of miles on it. The majority of Dealers I contacted were not at all interested in working with me. Southern Trust went the extra mile to help me get into a used low mileage Corvette and a really clean Toyota for my work car. I couldn't be happier! I now recommend S.T.A.G. to my customers, family and friends as often as I can. I want them to see what a great group of car/truck people can do. What an awesome Experience! They will be my go to dealer for all of my future purchases! Do not buy until you visit their Dealership. You will not be disappointed! Ok so i have changed my outlook to this dealer. They read my post about the issue with the tires and called us last week to offer a remedy. As of yesterday evening we now have 4 new tires and the car rides smooth. I want to thank Chuck and Chris for making things right. Based on the service we got I would recommend Southern Trust to anyone looking for a car. Thanks guys! Great Experience!!! Friendly and family oriented people. Strait negotiation. No Pressure. Fare Deal!!! Definitely recommended. Thanks a Lot. Let me start by saying that I hate the whole experience of car buying. From the overbearing, desperate sales people, to the negotiating, to them treating me like a child because I am in my 20's...I hate all of it. It gives me anxiety. The day before I visited STAG, I had gone to a larger dealership and practically been laughed out the door because of my not great credit (due to losing my steady job last year). I was taken into an office and talked to like I was a child with no idea about finance. I personally felt that because I am a server (Oh, the horror!) and not married with a family, the fact that I am a fully functioning 28 year old adult with a college degree was ignored. I was so angry and disappointed. I felt so disrespected Now, let me tell you about my experience with Nick and Jeff at STAG. I had seen that they had a Jeep Liberty on the lot at a great price, so the very next day I decided to go and check it out. Upon walking in, the place was clean and welcoming. I was greeted with a smile from Nick, who was only too happy to show me the car. He walked me around it, took a copy of my license and let me take it out for a drive. ON MY OWN. This was so nice as I felt less pressured and more able to check out the car at my own pace. It was so incredibly clean (I was told sometimes they even gut the whole interior just to make sure everything is cleaned... carpets, seats and all! ), it ran great, it was exactly what I wanted. I went back in, we ran numbers, I wasn't made to feel inferior because of my job, age, or credit score, and we came to an amazing deal. Jeff even gave me some advice on refinancing in a few months to get my payments down after I build my credit for a little while. I spent 2 hours at STAG and walked out with a new (to me) car. I was so incredibly impressed by the pleasant service and the quality that I brought my boyfriend in not even a week later to make a deal on a truck. We're going in tomorrow to pick it up. Another wonderful experience with some great advice and they're even throwing in some new tires! As far as cons, there are two. They don't offer warranties. You are buying a vehicle as is. Also, they don't haggle on prices. But the prices are very competitive with what you would find as a fair market value, and honestly, it takes so much pressure off. On one hand, you might be missing out on working a better deal, but on the other, you don't have to feel like you're going into battle. I honestly can't recommend this place enough. Nick and Jeff were wonderful and they have definitely earned some customers for life! Our sales rep Jeff A. was great! He spent a lot of time with 18 year old son and I to find pricing we could afford on a next to impossible vehicle that my son was wanting. This dealer is upfront and no pressure. It was nice how they would put the time into working with you. I have always hated car shopping! Having to spend so much money and feeling taken advantage of by salespeople. That changed though with this great group of people! Everyone was very nice and had answers to all of my questions! I truly couldn't have been happier with my experience! 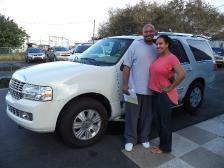 I was very happy with my whole experience with Southern Trust Auto Group. From the time I first stepped on the lot I was very comfortable. There was no high pressure salesman breathing down my neck and they have a great selection .The quality of the cars was great and so were the people.I would recommend them to everyone. I will be using them any and every time I am looking for a vehicle. They are far above the average car dealer. I will be a lifetime customer. The entire team was awesome, friendly and caring to your needs. Jeff Anderson was awesome and he really goes out of his way to satisfy your needs. I would 100% recommend friends, family and coworkers to this dealership and its awesome team.